For me, balance implies a certain skill in finding the important center of things, then working out from there – not allowing any one auxiliary part to extend or overweigh the other parts. Those who spin wheels (to make yarn, to move a bicycle, to hoop a hula, to form a pot, to carpool kids) understand this with all the small parts of their bodies. And, as I’m fond of saying in my classes, sometimes our bodies (hands, nerves, muscles) are smarter than our brains. For this reason, balance has become a PHYSICAL thing to me. Actually, I should say that the act of discovering the balance between physical and mental has allowed me to feel more secure in my design / teaching / knitting / crocheting / living / mothering / wiving / friending balance. 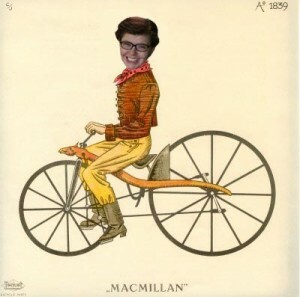 The physical touchpoint of my own balance has become my bicycling. By jumping onto my bike and riding an average of 6-7 miles a day, I’m able to keep my blood flowing, stretch out my lungs, see the neighborhood from a slow moving perspective, connect with the world around me and reduce my fibromyalgia pain significantly. My rheumatologist told me that she feels the increased blood flow is probably the reason for my decrease in pain, which makes sense to me. All I know is that I feel better, my joints hurt less, and I’m happier when I get a ride in. Having Fibro has forced me to embrace my humanity (and humility) in ways I hadn’t expected. Well, who DOES expect this – we’re all superhuman when we’re young, aren’t we? Fibro forces me to monitor my resources, gauge how much energy I have and how much an activity will take, and leave time after a big event (like Yarnover this past weekend) to recover my physical strength. 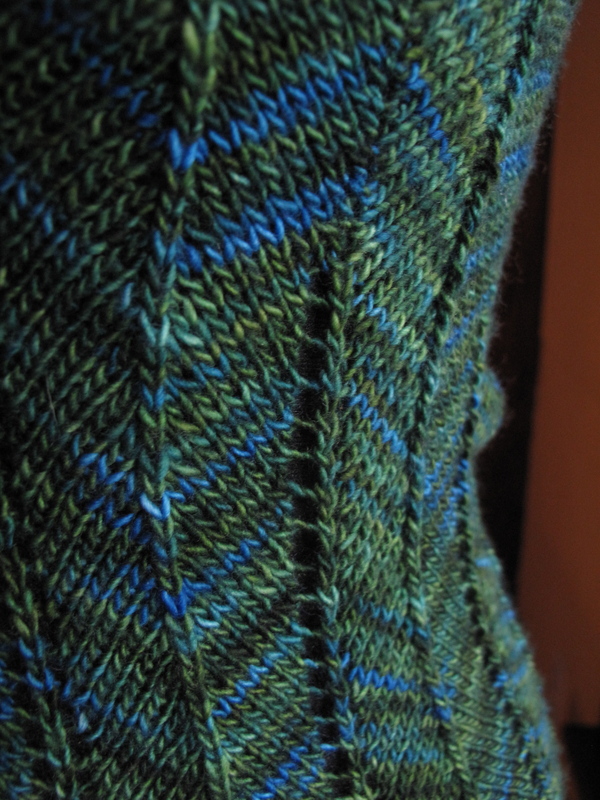 To folks who haven’t done it, standing in front of a class of 20 folks and explaining the intricacies of knit techniques may not sound like an energy-zapper, but it IS. I’m an extrovert to the extent that being around folks recharges my batteries, but I’m also an introvert in that I need time alone to recharge different–but just as necessary–batteries. For this reason bringing my bike to Yarnover and taking a chilly ride from the teaching location to the teacher’s dinner and back to a friend’s house for a post-dinner get-together was one of the best things I did. It compelled me to create time and space for myself, AND to get some physical exercise in and bike away the stiffness of the day. I travel light when I bike; I have a small basket and now I own a cool hobo bag from Steven Be that slings over my shoulder, and that’s about it. Lighter means balance is easier, nothing is harder than trying to carry a large load of groceries in the front of my bike, and that’s a lesson I try to take into my non-biking life. Carrying around grudges, hurt feelings and leftover pain can do nothing but cause my balance to shift uncomfortably, and that will make me fall. I’m working to learn to let nonsense that doesn’t add anything to my balance GO. For someone with an insanely inconsistent and dogged memory, this is a hard, hard thing to do. The quote reminded me that forgiveness doesn’t necessarily mean that the person who’s receiving the forgiveness is even aware of it. After all, don’t we often cause offense without realizing it? Maybe we can forgive in that same anonymous way? So my balance for this day (this week, this year – this life?) is trying to figure out how to let go of the myriad hurts I suffer (self inflicted or not) and forgive the source of them, even if that source is me. Maybe by doing this I’ll be worthy of forgiveness myself. I get all this from my bike, my family and my friends. And I get a great deal of it from my knitting–that is the place I go for balance when I feel I’m lacking it and veering off course. 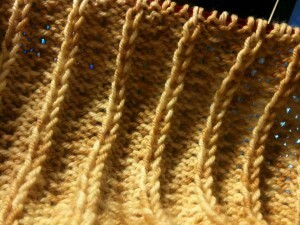 When the center is refusing to hold, I pick up my knitting, speed up my fingers and try to slow my mind. Okay, you want something different? This is not terribly knitting related, but it may make you laugh. Here’s the video I recently made when I auditioned for Project Runway. 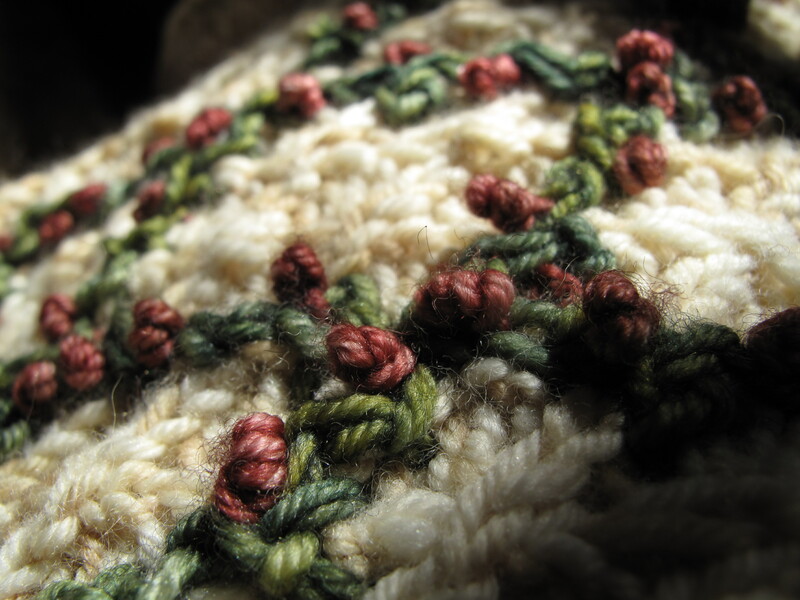 Knit & Crochet Blog Week – A Knitter or Crocheter For All Seasons? It seems I’m doomed to miss every other day of the Knit and Crochet Blog Week, but given the fact that I’ve been blogging an average of twice a month for a few months, this is quite a victory for me! 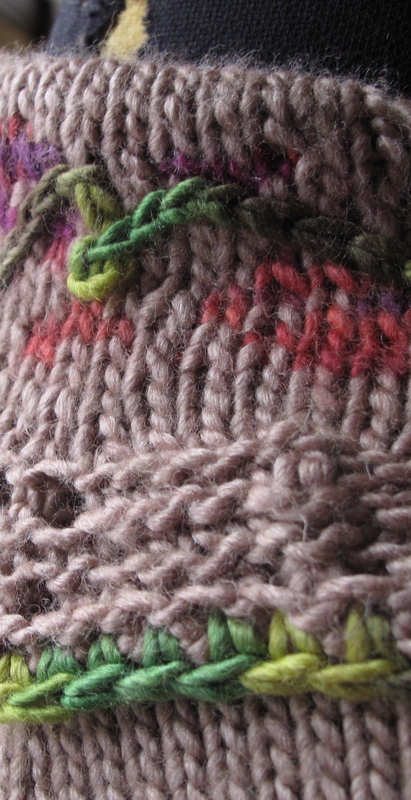 I love the topic today – knitting (& crocheting) to suit a specific weather / climate / time frame. 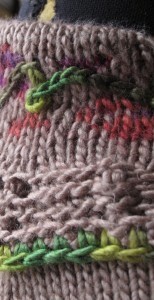 I often say in my classes that we don’t knit to make THINGS, we knit to make OURSELVES HAPPY. And that’s true. But it’s also true that having some useful, beautiful and completed item can make us happiest of all. Instead of worrying about completing an item to wear in the current season, I believe most knitters just want something comfortable to knit on. 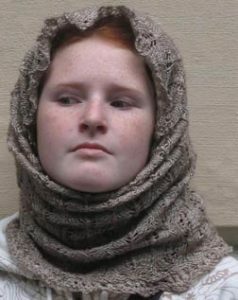 I’ll always fondly remember my two weeks teaching in Faugére for French Girl Knits in 2007, but one thing I WON’T remember fondly was hauling around a heavy, fuzzy alpaca project through a very hot Southern France, knitting on it every chance I got to make a late September deadline. I’m in an unusual situation because – due to editorial deadlines – I’m often working 6 months to 1 year ahead of the current season. Add to that designs I work up for magazines in other hemispheres (Australia & Japan) and my knitting really knows NO season. Which is a great way to be. 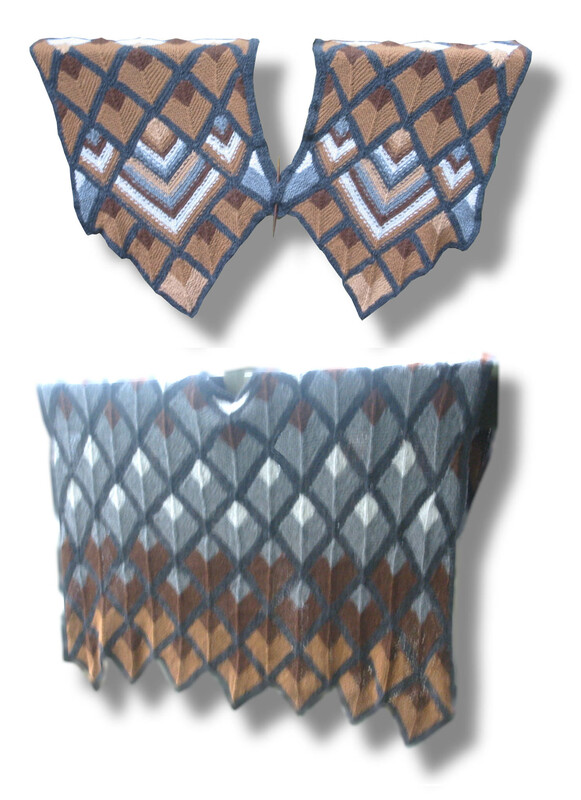 A knitted garment is not meant to be a frivolous wear-it-for-a-season-and-discard-it item. 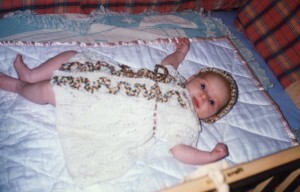 A hand knitted garment should be treasured, worn for years and passed along to a friend or family member. The idea of fretting to get something finished so it can be worn THIS SUMMER seems a bit beside the point to me; if it’s a well designed garment (without topical, faddish fashion gimicks) then a piece should stand the test of time and be able to be worn next Summer and all the Summers after that. These are excellent life-goal-oriented deadlines, they make sense because they mark the passage time time with a celebration or life event. But forcing ourselves to see a great design, commit to it, buy the yarn, figure out the pattern, knit the darn thing up, finish it AND wear it all in one season may be beyond the speed of an average knitter. And that’s absolutely fine. Carrying a project over a few seasons, deciding to make a beautiful Summer top that won’t be part of the wardrobe until NEXT year, is a realistic goal. Happiness can’t be measured in knitting speed, it’s the actual work – the process – that brings a great amount of the joy. Currently I’m working on a cardigan for a Spring magazine, a cape for the same magazine, a twinset for an Australian magazine (I believe it’s going to be for the Summer issue, but Australian seasons remain a mystery to me) I’ve purposefully used a very lightweight merino wool by Madeline Tosh for the tank top & cardigan so it will be a multi-season piece. A tank top will get more use in the Summer, but there are MANY winter days when I layer my clothing so I can deal with my own ‘personal Summers’ that pop up at the most unexpected moments. 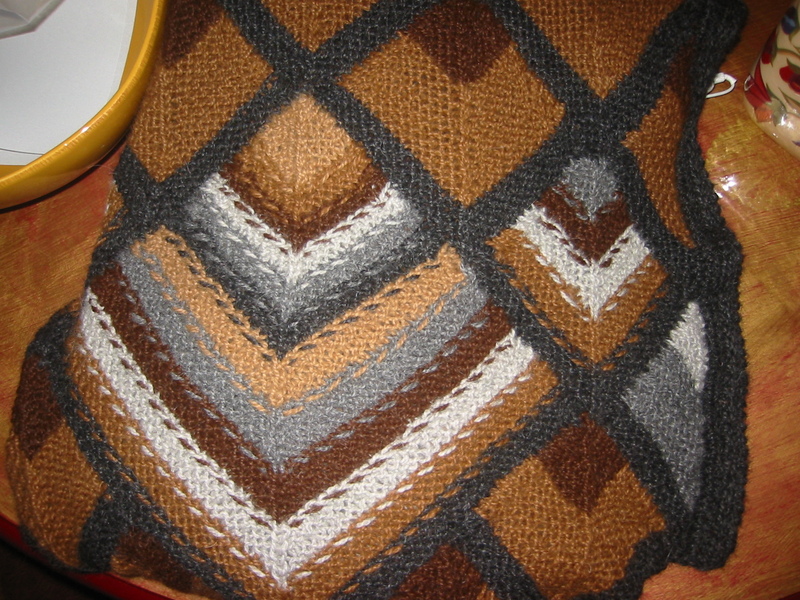 My advice to knitters is to use knitting as a source of pure enjoyment. Find the joy and love in everything you make, try not to get too caught up in deadlines, and let passion guide you toward projects that speak to you. 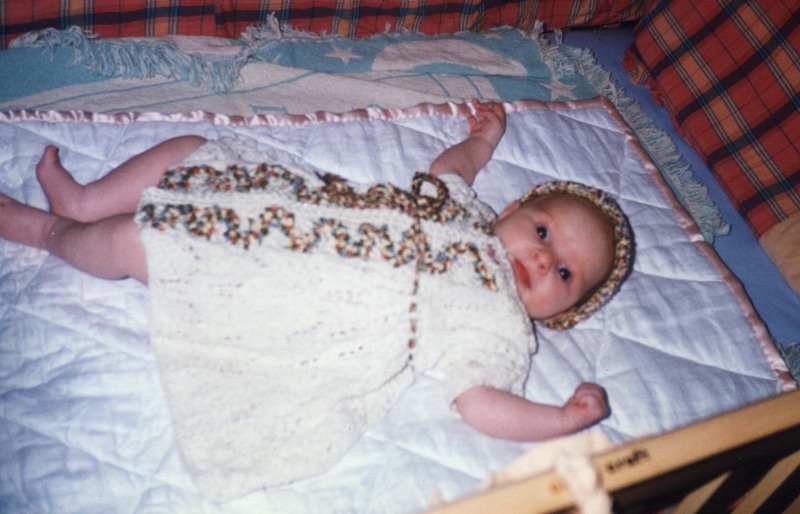 Knit & Crochet Blog Week – Photography Challenge Day! 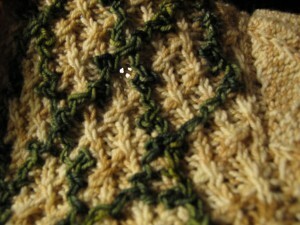 Well, I missed Day 1 of the Knitting & Crochet Blog Week, but here I am to participate fully in DAY 2! I used to publish a lot more photographs of my work in progress, but limits on energy and fears about releasing some editorially-secure information have made me less photo-happy. I use my photography as part of my job, to tell the story of my work, and to ‘sell’ a design. I usually take a LOT of in-process photographs (which usually never see the light of day and are hidden away in my iphoto album) so I can recreate a technique or use it to create a line-drawing illustration. To be honest, by the time a design is published I’m generally so involved in current projects that I have a hard time getting excited about digging up those old process photos and publishing them – but that’s exactly when I should be making them public! I’ll often photograph or scan a swatch so I can isolate a repeating stitch pattern, shrink it, then ‘wallpaper’ it into one of my electronic sketches to present an eerily realistic vision of how I see the final garment. 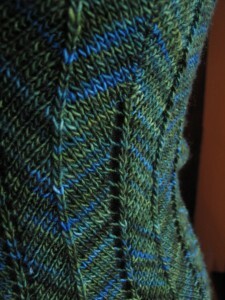 But generally I’m relegated to tight little closeups of a garment (no revealing full body shots) or beauty shots of yarn. For instance, I don’t think I’d be giving TOO much away to show how I’m using an all-0ver cable/trellis pattern to create a framework upon which I build a rose-garden of decorative chain embroidery & french knot roses. Once the trellis pattern is established, it’s relatively simple (remember, simple does NOT mean easy) to work a decorative chain using a crochet hook along the trellis grid. 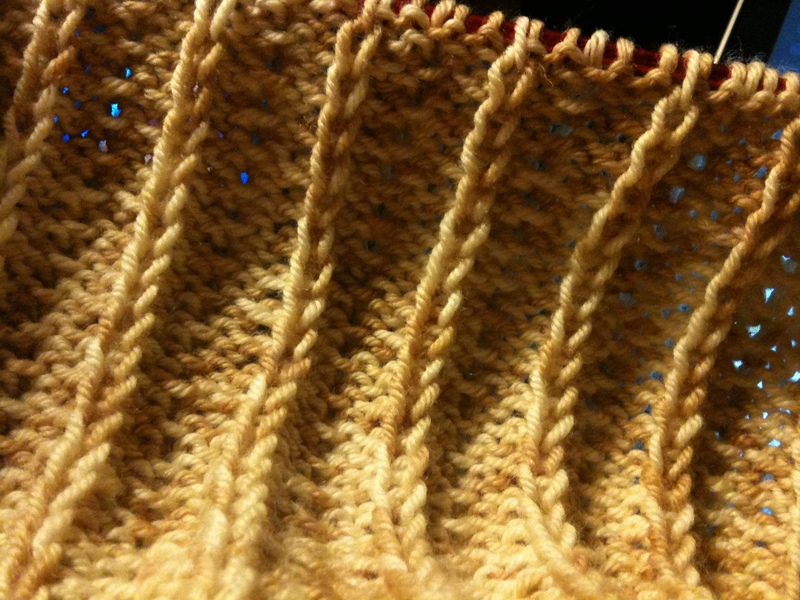 I’ve tried to wiggle the line, making an irregular vine pattern here. The result is a lot of bang for the buck, and a chance for knitters to expand their horizons in a non-threatening way. You don’t have to be a mistress-embroiderer to make this look good, and if you’d decide to just forego the embroidery you’d still have a lovely cardigan with a nice cable/trellis pattern strategically placed to be very flattering.